famfriendsfood: Target, Box Tops for Education & a Giveaway! - CLOSED!!! Target, Box Tops for Education & a Giveaway! - CLOSED!!! This giveaway is now closed. Winner will be announced on a separate post dated Friday, August 20th. 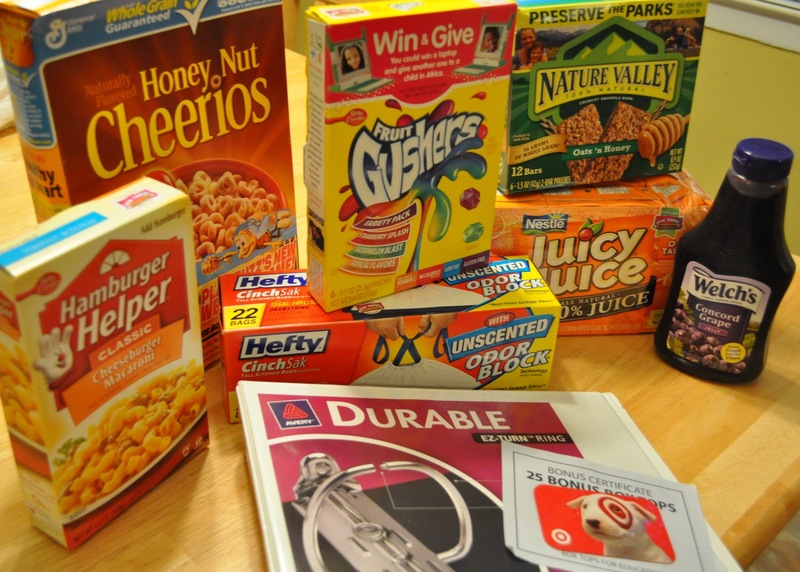 Does your school collect Box Tops for Education? I think many schools do since it is a really simple program for raising money for your school. I was thrilled when I was asked by My Blog Spark if I wanted to help promote a new program that Target is running to help parents collect extra Box Tops for their local schools by offering DOUBLE BONUS BOX TOPS when you purchase 5 items with the Box Top Logo on them from Target between now and August 28th! You can visit Grocery Savvy for more information and a list of products that have the Box Tops on them. Lately, it seems our schools are in more need of financial assistance than in previous years, and this is a great way to help by purchasing items you already use. From Ziploc sandwich and freezer bags to Simply Gogurt for the lunchboxes. My Blog Spark sent me a fabulous prize pack with an Avery Binder, Betty Crocker Fruit Gushers Variety Pack, Hamburger Helper Cheeseburger Macaroni, Hefty CinchSak Trash Bags, Honey Nut Cheerios, Juicy Juice 8-Pack Juice Boxes, Nature Valley Crunchy Granola Bars, Welch´s Concord Grape Jelly, as well as 25 Bonus Box Tops and a $25 Target® gift card to use to purchase more of my favorite participating Box Tops items. I've got a prize pack just like this that My Blog Spark has generously offered to give to one of my readers! How do you enter to win? Leave a comment sharing your favorite product that has the Box Tops logo, or how you use one of the food products with the Box Tops logo for quick and easy meals or snacks. Or you can share what items you will stock up on to receive the Double Box Top Bonsu from Target. You can check out Grocery Savvy for ideas. Be sure to leave your blog address or an email where you can be reached if your entry is selected as the winner. This giveaway is only open to U.S Residents. All entries must be received by Thursday, August 19th by 11 p.m. Eastern Standard Time. The winner will be selected by random.org and announced on Friday, August 20th. Disclosure: The prize pack and information on the Double Box Tops program with Target were to me by General Mills through My Blog Spark. My favorite Box Top product is Cheerios. I love their cheerios...they are awesome!!! I will be stocking up on Nature Valley granola bars and Juicy Juice (for the husband!)! We love Juicy Juice and all the Pillsbury products(biscuits, cinnamon rolls, crescents)! I will be getting HB Helper, Cheerios and Juicy Juice. Cheerios are our family's favorite items with Box Tops! Fiber One Cereal and cereal bars! My favorite is Honey Nut Cheerios. I will be looking for cheerios! We love Cheerios and Lucky Charms!! I love the Fiber One products. We like any of the Cheerios cereals and I would stock up on those and the juicy juice packs for my girls lunchbox. Thanks for the wonderful giveaway. My favorite box tops products Ziploc bags! My favorite are Pillsbury refrigerated biscuits! I love making Monkey Bread with them! I love gushers and my son loves plain cheerios with cinnamon sprinkled on them and baked!! My kids love the scooby doo fruit snacks!! We love to buy Huggies! Our family loves Cheerios but I also love Totino's Pizza Rolls!! You gotta love them:) Please enter me in this giveaway. Would love to win it. Thanks! I would definitely stock up on Pillsbury items. Thanks for the chance at winning this pack. I love Reese's Puffs cereal! Mmmm! And I would LOVE to win. My favorite product is Cherrios. We love the nature valley granola bars! We love Cinnamon Toast Crunch! We LOVE Nature Valley Oat's 'N Honey Bars and for lunch now that the grand-daughters are back in school I open up a can of Progresso SW Style Veggie soup. cheerios for my dad and gushers for me definitely. We love Honey Nut Cheerios!! It is a toss up between Honey Nut Cheerios and Pillsbury biscuits and cookies....we buy lots of all of them. Favorite product is Nature Valley bars. I'd buy Cocoa Puffs for double points. We've already began stocking up on cereal! My favorite box tops product is Fiber One bars! I love Honey Nut Cheerios! I eat honey nut cherrios as a snack to lower cholesterol and it works! My favorite is Hamburger Helper. I'd get more Juicy Juice box drinks because we always have them on hand! We love Totinos Pizza Rolls! My favorite box top item is Cheerios (Honey Nut). Mmm! I don't think this household could survive without Cheerios! I would stock up on all my favorite General Mills cereals. We bake Betty Crocker (supreme) brownies at least once a week, and they are box top products too. Cereal for sure! I think Honey Nut Cheerios are the best and they make a great snack too. We make yogurt parfaits for a fun and yummy snack with box tops yoplait yogurt sprinkled with fruit and crushed (box tops) cheerios! I like the Nature Valley Granola bars. I LOVE biscuits! They have great boxtops attached.